Wiley Hardeman. Photo © Underwood & Underwood. Wiley Hardeman Post (22 November 1898 - 15 August 1935) was a famed American aviator during the period known as the Golden Age of Aviation and the first pilot to fly solo around the world. Also known for his work in high-altitude flying, Post helped develop one of the first pressure suits and discovered the jet stream. Young Wiley's first view of an aircraft in flight came in 1913 at the county fair in Lawton, Oklahoma. The plane was a Curtiss-Wright "Pusher type". The event so inspired him that he immediately enrolled in the Sweeney Automobile and Aviation School in Kansas City. Seven months later, he returned to Oklahoma and went to work at the Chickasaw and Lawton Construction Company. William Penn Adair "Will" Rogers. William Penn Adair "Will" Rogers (4 November 1879 - 15 August 1935) was an American cowboy, vaudeville performer, humorist, newspaper columnist, social commentator, and stage and motion picture actor. Rogers became an advocate for the aviation industry after noticing advancements in Europe. During his 1926 European trip, he witnessed the European advances in commercial air service and compared them to the almost non-existent facilities in the United States. Rogers's newspaper columns frequently emphasized the safety record, speed, and convenience of this means of transportation, and he helped shape public opinion on the subject. Post's aviation career began at age 26 as a parachutist for a flying circus, Burrell Tibbs and His Texas Topnotch Fliers, and he became well known on the barnstorming circuit. On 1 October 1926, an oil field accident cost him his left eye, but he used the settlement money to buy his first aircraft. 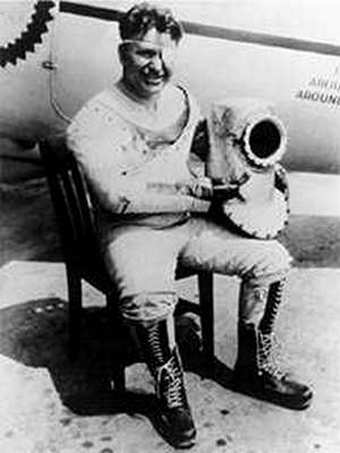 Wiley Post in his third pressure suit. 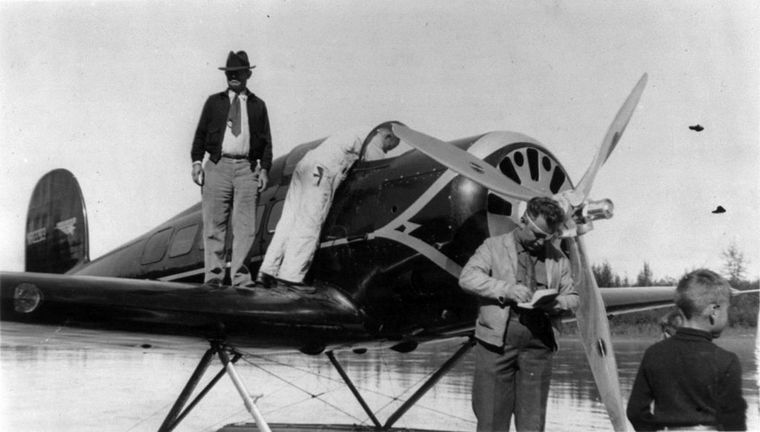 Photo © commons.wikimedia.org.In 1934, with financial support from Frank Phillips of the Phillips Petroleum Company, Post began exploring the limits of high-altitude long-distance flight. The Winnie Mae's cabin could not be pressurized, so he worked with Russell S. Colley of the B.F. Goodrich Company to develop what became the world's first practical pressure suit. 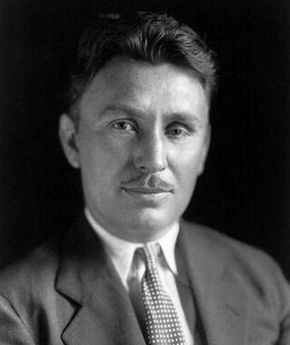 Three pressure suits were fabricated for Wiley Post; only the final version proved successful. The first suit ruptured during a pressure test. The redesigned second suit used the same helmet as the first but when tested was too tight and they were unable to remove it from Post, so they had to cut him out thus destroying the suit. The third suit was redesigned from the previous two. The body of the suit had three layers: long underwear, an inner black rubber air pressure bladder, and an outer layer made of rubberized parachute fabric. The outer layer was glued to a frame with arm and leg joints that allowed him to operate the flight controls and to walk to and from the aircraft. Attached to the frame were pigskin gloves, rubber boots, and an aluminium-and-plastic diver's helmet. The helmet had a removable faceplate that could be sealed at a height of 17,000 feet and could accommodate earphones and a throat microphone. The helmet was cylinder-shaped with a circular window. In the first flight using the suit on 5 September 1934, Post reached an altitude of 40,000 ft above Chicago. Eventually flying as high as 50,000 ft, Post discovered the jet stream and made the first major practical advances in pressurized flight. Post was the personal pilot of wealthy Oklahoma oilmen Powell Briscoe and F.C. Hall in 1930 when Hall bought a high-wing, single-engine Lockheed Vega, one of the most famous record-breaking aircraft of the early 1930s. 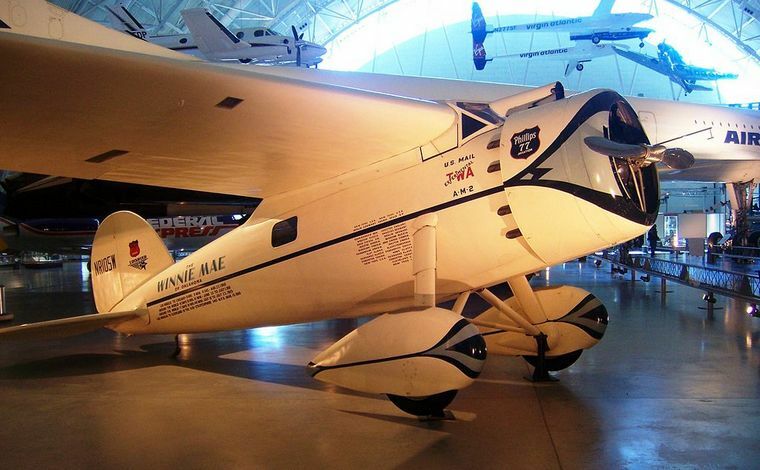 The oilman nicknamed it the Winnie Mae after his daughter, and Post achieved his first national prominence in it by winning the National Air Race Derby, from Los Angeles to Chicago. The fuselage was inscribed, "Los Angeles to Chicago 9 hours. 8 minutes and 2 seconds 17 August 1930." Adam Charles Williams finished second with a time of 9 hrs. 9 min. 4 sec. In 1930 the record for flying around the world was not held by a fixed-wing aircraft, but by the Graf Zeppelin, piloted by Hugo Eckener in 1929 with a time of 21 days. 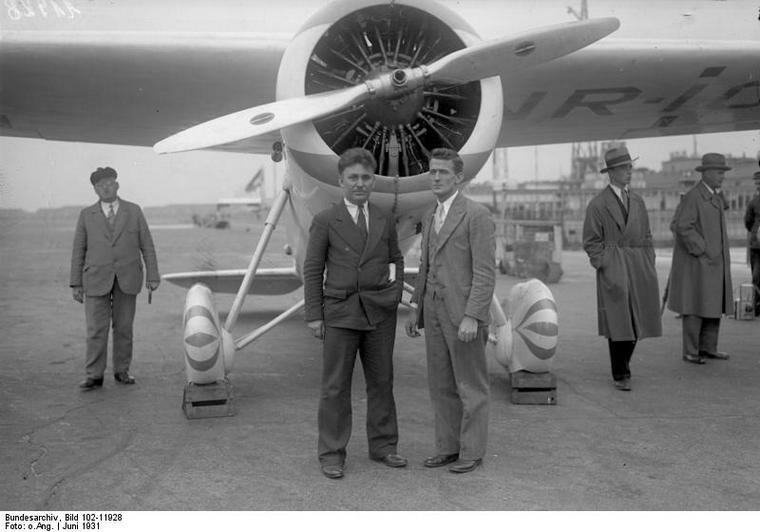 On 23 June 1931, Post and his navigator, Harold Gatty, left Roosevelt Field on Long Island, New York in the Winnie Mae with a flight plan that would take them around the world, stopping at Harbour Grace, Flintshire, Hanover twice, Berlin, Moscow, Novosibirsk, Irkutsk, Blagoveshchensk, Khabarovsk, Nome where his propeller had to be repaired, Fairbanks where the propeller was replaced, Edmonton, and Cleveland before returning to Roosevelt Field. They arrived back on July 1, after traveling 15,474 miles (24,903 km) in the record time of 8 days and 15 hours and 51 minutes. After the flight, Post acquired the Winnie Mae from F.C. Hall, and he and Gatty published an account of their journey titled, Around the World in Eight Days, with an introduction by Will Rogers. 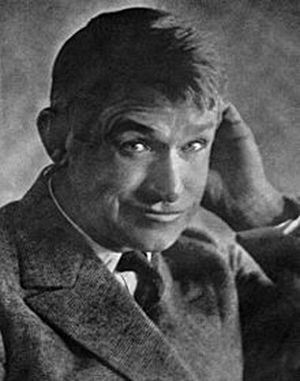 Post's friend Will Rogers visited him often at the airport in Burbank, California, while Pacific Airmotive Ltd. was modifying the aircraft, and asked Post to fly him through Alaska in search of new material for his newspaper column. When the floats Post had ordered did not arrive at Seattle in time, he used a set that was designed for a larger type, making the already nose-heavy hybrid aircraft still more nose-heavy. However, according to the research of Bryan Sterling, the floats were the correct type for the aircraft. After making a test flight in July, Post and Rogers left Lake Washington, near Seattle, in early August and made several stops in Alaska. On 15 August they left Fairbanks, Alaska, for Point Barrow. They were a few miles from Point Barrow when they became uncertain of their position in bad weather and landed in a lagoon to ask directions. On take-off, the engine failed at low altitude, and the aircraft, uncontrollably nose-heavy at low speed, plunged into the lagoon, shearing off the right wing, and ended up inverted in the shallow water of the lagoon. Both men died instantly.